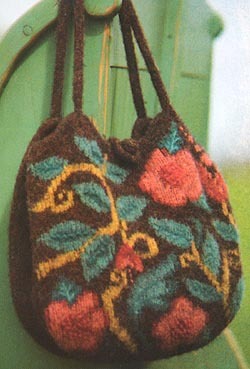 This felted purse is knit using Jamieson's Shetland Heather Aran and Double Knitting 100% wool yarn and is from the Fall/Winter 2006 Issue of Knit It! magazine from Better Homes and Gardens. The design is by Nicky Epstein and yarn kits are detailed below. The pattern is not included in the kit but can be found in the Fall/Winter 2006 edition of the Knit It! magazine from Better Homes and Gardens. We do not sell this magazine but it can be found on most newstands in North America.